A sailboat crashed into the USS Midway museum in San Diego Harbor and lost its mast, police said Sunday. Around 2:15 p.m., the 38-foot boat became caught in some of the Midway’s netting and struck the ship, snapping off the sailboat’s mast, San Diego Harbor Police Sgt. Scott Ferraioli said. There were eight people aboard the boat at the time and an unknown amount of people touring the USS Midway museum, but no one was injured, Ferraioli said. The sailboat was towed away. 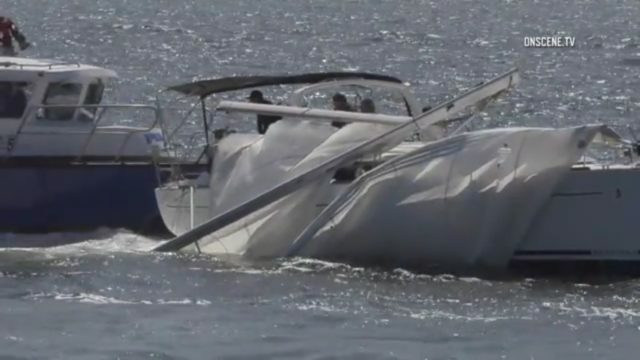 No criminal behavior was suspected as a cause of the crash, and no one aboard the sailboat was arrested, Ferraioli said.